Add a brilliant look to your patio or home with this Whitehall French Bronze Celestial Clock and Thermometer Package. This striking set of a sun themed clock and moon motif thermometer brings a unified look to your time and weather monitoring, while the bronze color of each adds an elegant hint. An intent look on the sun's face creates a focal point for the Whitehall French Bronze Sunface Clock, while Roman numerals around this accent create an analog timepiece. Gold colored hands remain visible for easy timekeeping, and an included, AA battery powers it. Place this clock against an indoor or outdoor wall, and situate the Whitehall French Bronze Moon Thermometer next to it to enhance the theme. A crescent moon with an aged countenance occupies part of the center, and a bevy of constellations adorns the rest of this area. Dots and numerals surround this face to note the temperature from -70° to 150° Fahrenheit, and a gold colored needle keeps this visible. 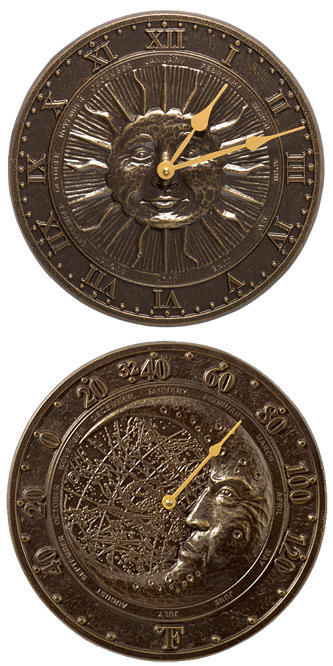 A thin circle around the celestial accent on both the thermometer and clock lists the months of the year, and the bronze color on each meshes with the outdoors. The all aluminum construction of each item is perfect for use in the home or on your deck, and the units mount to a wall in moments. Bring a heavenly look to your garden or family room with this French Bronze Celestial Clock and Thermometer Package. Made in the USA. Qty 1 Whitehall Sunface Clock, French Bronze, 12" dia. Qty 1 Whitehall Moon Thermometer, French Bronze, 12" dia. Whitehall Moon Thermometer, French Bronze, 12" dia.